The 101 Horror Movies book strikes again. A while ago, I had picked up one of those awesome little Warner DVD sets of 4 movies for like $7.99! 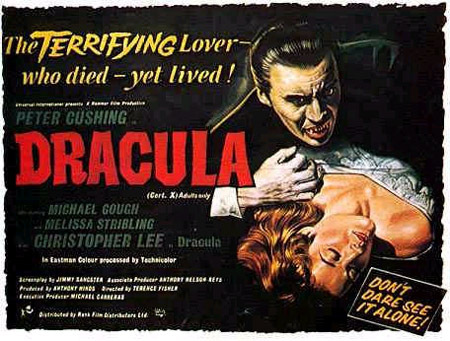 It featured four Hammer films, one of which was Horror of Dracula, which I re-watched the other night. Based, loosely, on Bram Stoker’s novel, this Hammer film, like its predecessor Curse of Frankenstein was filmed in colour which was used to highlight things like the splash of blood, or the ruby-red lips of undead sirens. The film also reunites Peter Cushing and Christopher Lee. Cushing takes on the role of Van Helsing, while Lee takes on the title role, and has a staggering 13 lines in the entire course of the film. 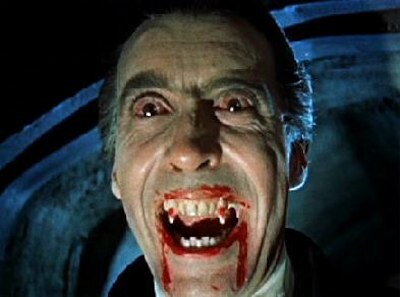 It’s a nice take on the Dracula story, and one that Hammer revisited a number of times, bring back Christopher Lee a few times to play his imposing version of the most famous vampire in history. The colour, as mentioned before, is garish and simplistic. But that makes it stand out, to have the effect that the filmmakers wanted at the time. It also seems to mark the last time I watch a vampire movie for some time, as there doesn’t appear to be another in the book until I hit the 70s! 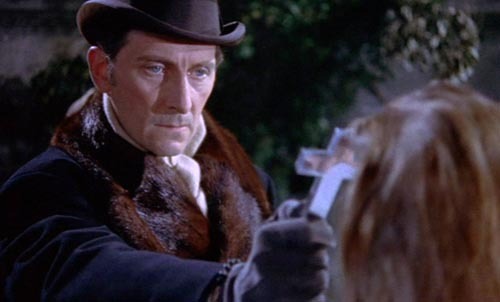 Cushing is splendid as Van Helsing, and it’s always nice to associate him with another role besides Grand Moff Tarkin. The film definitely likes to combine the horror elements with the suggestion of the sensual. There are shots of heaving bosoms in bodices, and all the women turned into vampires seem to wear them. No wonder so many fall victim to them! Hammer films have always been kind of known for that, and it works! But on top of that, they tend to make entertaining horror films and this one falls into the category. Previous Post Downton Abbey – Now What?